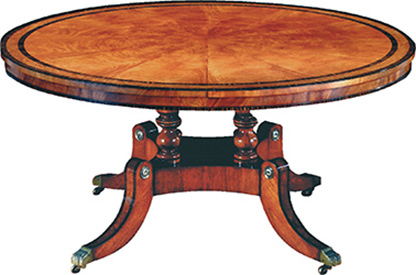 Mahogany extending dining table of classic Regency style. This table has the facility to extend in length by the addition of one or two of the loose leaves supplied. Telescopic runners extend to support the leaves. The top is radial veneered with highly figured mahogany and completed with an elegant crossbanding of burr-elm bordered with coromandel and ebony stringing. Burr- elm and coromandel is used to decorate the top face of the legs of the turned column and platform base.